I live and work with environmental awareness - the “Green” slogan-reduce-reuse-recycle. My studio space has always been close to my living space, reducing fuel and pollution. These days it is located on the same property as my home. The building has been transformed from a dilapidated old garage into a light filled studio. In the process, salvaged components from previous home projects have been creatively incorporated throughout. Skylights and windows supply the studio with natural light. 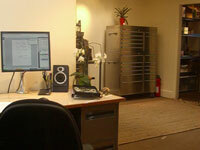 So, in my everyday studio operations, I use minimal amounts of utilities for lighting, heating, cooling, and equipment. The trade of goldsmithing has changed little over the centuries. Tools will last a lifetime and are often handed from master to apprentice. 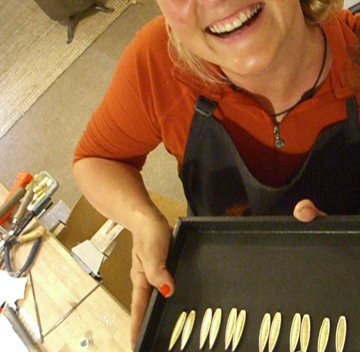 As a modern studio art jeweler, I still use mainly hand tools that need no power at all. Sawing, filing, and hammering are key operations executed by my own strength. Electricity is needed mainly for minor and intermittent task lighting and computer use. For years, I operated in a space without running water. My current space finally and happily has a sink. I need only a few gallons of water per week, use biodegradable soap and redirect grey water into my garden. I do use gas, propane and oxygen, to solder and fuse metal components together, but one bottle of 5 gallons lasts me a full year! My use of chemicals is also minimal, as I am aware that I do not want to expose my body or our environment to them. Only small amounts of diluted sulphuric acid, later easily neutralized with baking soda and Liver of Sulphur (found in eggs) are regularly used to create my jewelry. Daily operations of my office are transitioning, as business contacts are choosing to switch to on-line communications. My advertising and communication is predominantly via e-mail, photography is digital, art show application, etc are on-line. Scrap paper is utilized for sketches of new designs. Most of what I buy is “green”. I purchase my silver and gold from certified green suppliers, such as Academy Corporation and Hoover and Strong. All precious metal scraps in the making of my work are collected and reclaimed for use in the future works. When you receive a package from me, you will find previously used packaging materials. I save all clean and usable wrapping materials and reuse it for my shipping needs. Anything I can no longer use, is separated, diverted to other worthy uses, or recycled. In my personal life, I try to live responsibly and with respect for myself, my fellow humans and animals, and our common environment. Growing up in Germany, certainly set a tone in my life of using resources conservatively. As such, I am an avid recycler, enjoy wearing vintage or second hand clothing, am thoughtful about my use of utilities and car travel, buy local products, and my home is furnished with antique furniture. And last but not least, "I enjoy drinking fair trade shade grown organic coffee and growing my own vegetables!". I create a product made with responsible and sustainable practices. Although some of my metals and gems are purchased from outside this country, my work is all handmade in this country with social and environmental stewardship in mind at all times. I feel very confident that you can look and feel good about purchasing and wearing my jewelry. I welcome any feedback or suggestions on my applications of greening my business.